It’s regrettable that United’s season looks as though it’s going to peter out after another (if still rare) sub-standard performance against a team near the bottom. Home points thrown away against Bristol City, Cardiff City, Aston Villa and Millwall were unfortunate but could be excused as they came against some of the top sides in the division. United were the better side in all four but gained just two points. 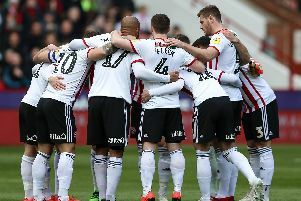 Ultimately four matches have cost United a play-off place: the defeats at home to Bolton Wanderers and at Hull City, Barnsley and Birmingham City, where not only were the results bad but so were the performances. The reason for this probably escapes even Chris Wilder, so I can’t really offer an explanation. Wilder’s comments after these four games sum up the season better than anything anyone else can say. Outstanding on so many occasions, United are missing that … something. That something that makes the best teams stand out from the rest, that something that produces wins even from a bad performance. United haven’t won all season when we have been the poorer side, but we have lost many points when we’ve been the better side. That something that might be termed a ruthless streak. But ‘that something’ usually costs. And unless the boardroom squabble is sorted out quickly, ‘that something’ might still be missing.